Tim Southee and Daniel Flynn have been recalled to New Zealand's squad for the third Test against India starting in Wellington on Friday. The two are part of a 13-man group that does not feature the batsman Jamie How, who played in Napier, although he will initially remain with the squad as a cover player for Flynn. New Zealand have been without Flynn since he suffered a bruised left hand when he was struck by a delivery during the first Test in Hamilton and while he is expected to be fit by Friday, his availability will not be confirmed until later in the week. The addition of Southee could spell his return to the Test side having not played since the Adelaide Test against Australia in December. 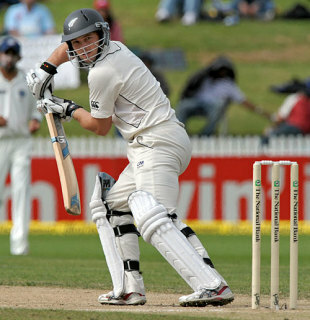 Southee's most recent appearance for his country came in the Christchurch ODI against India, where his ten overs cost a whopping 105, but he has fought back strongly in the domestic first-class competition. "Tim's inclusion gives us additional options with the new ball, and strengthens the attack against this strong Indian batting lineup," the chairman of selectors Glenn Turner said. Jacob Oram and Brent Arnel were not considered as they continue to recover from injuries. India lead the three-Test series 1-0 after they held off New Zealand for a draw in Napier on Monday. New Zealand squad Martin Guptill, Tim McIntosh, Daniel Flynn, Ross Taylor, Jesse Ryder, James Franklin, Brendon McCullum (wk), Daniel Vettori (capt), Kyle Mills, Tim Southee, Jeetan Patel, Iain O'Brien, Chris Martin.